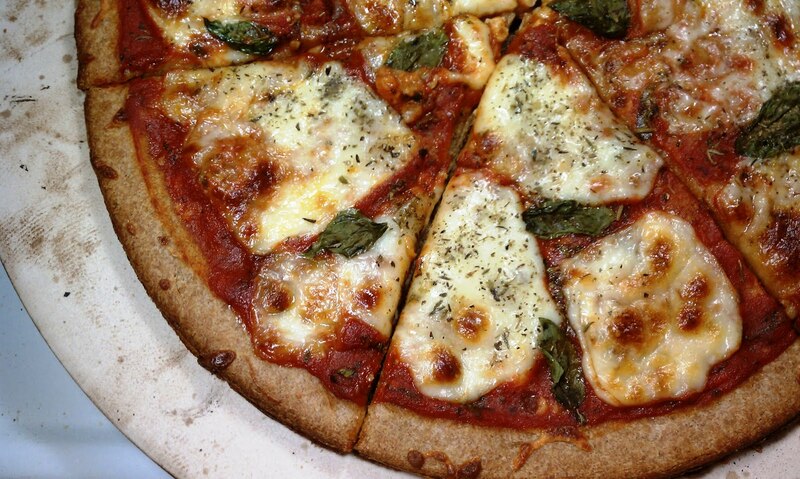 This, to me, is the perfect Margherita pizza. The crust is thin, light and crispy. The sauce is thick and tomato-y. The fresh mozzarella is mild and cheesy. The basil leaves are bright and fresh. When I bit in and my mouth filled with saucy, cheesy, herby goodness I’m pretty sure I had a pizzagasm. I’m really excited that the sauce turned out delicious because I basically made it up as I went along. I wanted it to be thicker than pasta sauce, so I figured if I used the whole tomatoes (canned) and blended them with a little tomato paste I could achieve that effect. It worked! 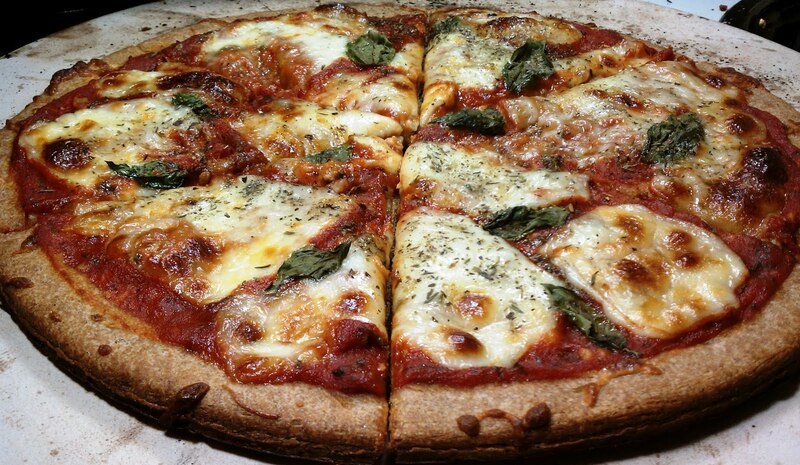 I also like the basil leaves to be baked along with the pizza, but you can sprinkle them on top after baking if you prefer them uncooked. 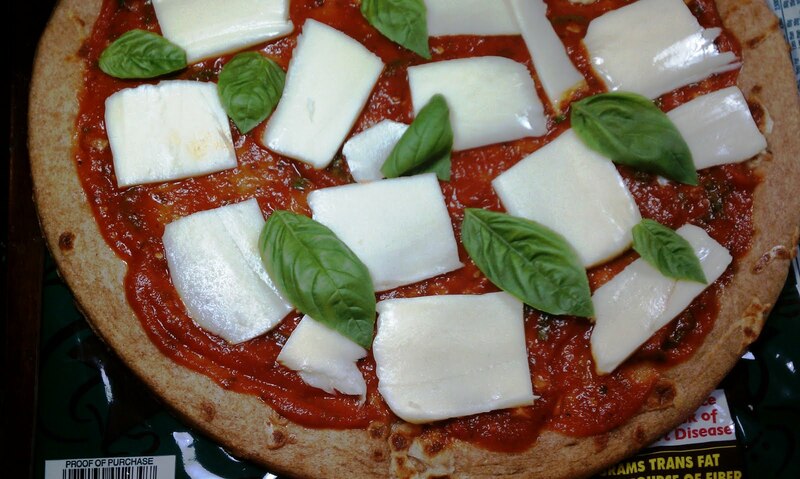 Margherita Pizza got its name in 1889 when Queen Margherita of Savoy was visiting Naples. The queen was served a red, white and green pizza representing the colors of the Italian flag. The simple and delicious flavors of tomatoes, mozzarella and basil have remained a popular combination over 100 years later – taste this pizza and you’ll immediately see why! 2. In a small saucepan, heat oil over medium heat and add garlic. Cook until golden and fragrant. Combine the canned tomatoes and tomato paste in a blender and blend. Add the tomato sauce, sliced basil, oregano, sugar, bay leaf, salt and pepper to the saucepan. Reduce heat and simmer, uncovered, about 15 minutes until sauce is thickened. There should be about ½ cup of sauce. 3. 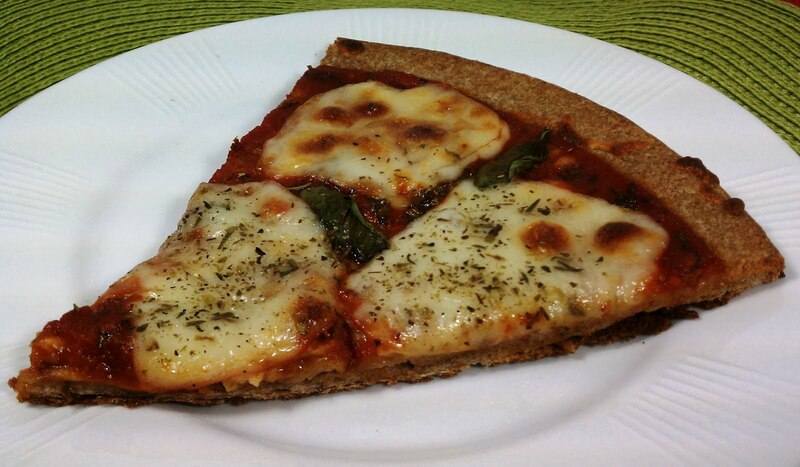 Spread pizza sauce evenly across the top surface of the pizza crust, leaving at least a ½ inch edge around the outside. Lay the slices of mozzarella across the top of the pizza. Spread the basil leaves on top of the mozzarella. Finish the pizza by sprinkling the Italian seasoning over top. 4. Place pizza on a foil covered baking sheet, a pre-heated pizza stone (my preference) or straight onto the oven rack (depending on how you like your crust) and bake for 8-10 minutes.